The LT665 camera accurately captures and analyzes wavelengths from 190nm - 1100nm. It features a compact design, wide dynamic range, unparalleled signal to noise ratio, and a 1" format that makes it ideal for beam profiling of large beams. The large format LT665 USB 3.0 silicon CCD high resolution camera is available with the following versions of software. What is the distance from the front of the camera to the sensor? This C-mount Standard camera has a sensor depth from the front of the camera to the sensor of 17.5mm. What is the saturation level of the LT665 camera? 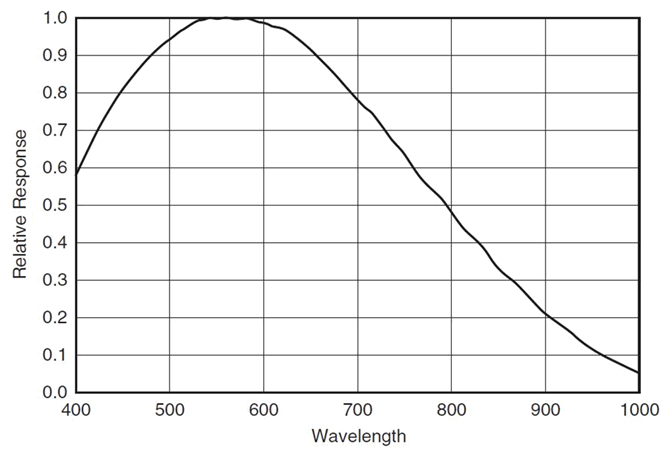 At what wavelengths is the LT665 most responsive? What is the framerate of the LT665? What beam sizes can I measure with the LT665? The accurate beam size minimum is derived by the pixel size of the camera. In order to get an accurate measurement, there must be enough coverage of pixels to ensure that illuminating another pixel will not over exaggerate the beam size. BeamGage Professional partitions with multiple beams on one display with individual results. Using the built in photodiode trigger on the SP620U and SP503U cameras.